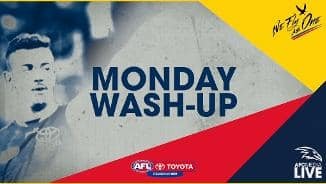 Hawthorn, sitting second-last on the ladder before the start of Round 14, has produced one of the biggest upsets of the season, stunning top-of-the-table Adelaide by 14 points at Adelaide Oval on Thursday night. Trailing by 18 points at half-time, the Hawks dominated the second half with eight goals to three to quieten the crowd of 45,312. 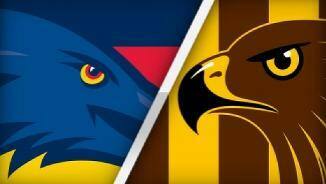 Hawthorn is now a perfect 3-0 against the Crows at Adelaide Oval after the 14.12 (96) to 12.10 (82) victory. Hawks recruit Ricky Henderson (30 disposals, two goals) got the last laugh over his former side in his 100th game, Shaun Burgoyne (26 possessions with 17 contested) was outstanding and Rising Star nominee Ryan Burton produced two clutch goals in the third term. Veteran Grant Birchall (28 disposals) was also influential in his return from a knee injury while Tom Mitchell continued on his merry way with a game-high 38 disposals. 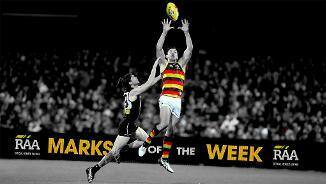 The Hawks kept Crows star Rory Sloane (23 touches) in check. A late goal to impressive midfielder Hugh Greenwood gave the Crows a five-point lead at the final change, but the Hawks couldn't be stopped. After a couple of close calls, goals to Paul Puopolo and Henderson sealed the deal and ensured the Hawks (5-8) have a finals heartbeat. "It was just about persevering," Hawks coach Alastair Clarkson said. "Those sort of scramble balls that were 50/50 or favouring Adelaide in the first half, with perseverance those scramble balls started to fall our way. "I thought we played terrifically well the whole game, but particularly in the last quarter, when the game was on the line. "Considering the opposition, the hostile crowd, we were able to hang in the contest and drive the ball forward and give ourselves a chance to win." 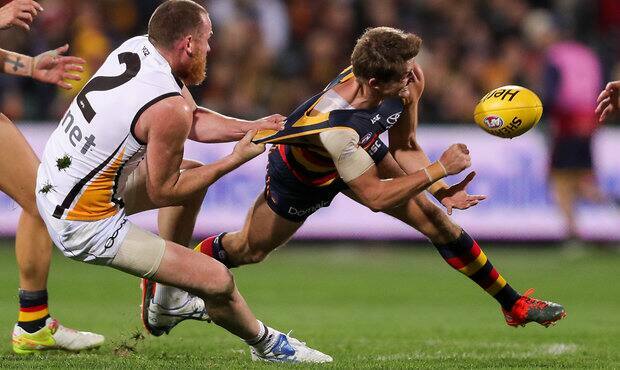 The Crows (9-4) have now lost four of their past seven games after winning six straight to start the season to put their premiership credentials in doubt. 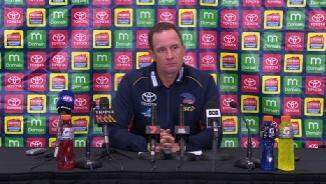 "It was a disappointing night," Crows coach Don Pyke said. "For whatever reason, our execution tonight was miles off the level that we've experienced. "Even at half-time, talking to the playing group, a lot of the indicators were trending our way, we were in front on the scoreboard, and unfortunately in the third quarter it continued. "We never really got into gear." It took the Hawks just 42 seconds to kick more goals than they did in the entire first half of their previous visit to Adelaide Oval three weeks ago. 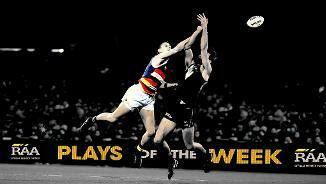 That night, they were kept to just 0.3 in the first two quarters against Port Adelaide in a one-sided encounter. But with a quartet of premiership players in Luke Hodge, Grant Birchall, Luke Bruest and Ryan Schoenmakers back in the team and bringing 796 games of experience with them, the Hawks were an entirely different proposition. They slowed the Crows down, didn't allow them to break from half-back and made the most of their own attacking opportunities. Nothing separated the two sides at quarter-time with the scoreboard locked at 4.2 (26). 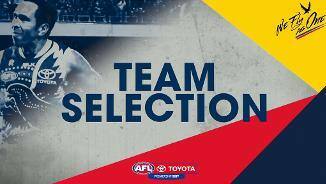 Hawthorn followed the blueprint laid down by the rest of the competition in keeping Adelaide star Rory Sloane quiet. Daniel Howe was given the job at the opening bounce of applying physical pressure to the club champion and last year's All-Australian vice-captain. However, it wasn't just left to Howe, the Hawks applying a team defence philosophy with several players getting turns at annoying and pestering Sloane. The Crows were being seriously challenged for one of the few times this season. Momentum swung their way in the final six minutes before half-time courtesy of two goals to Josh Jenkins and something special from skipper Taylor Walker. A snap from Jenkins somehow bounced through without being touched courtesy of an Eddie Betts shepherd in the goal-square. 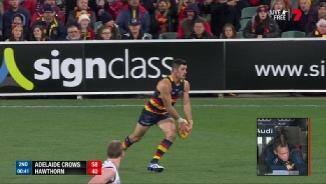 Jenkins then shoved Hodge out of the way to win the contested ball and snap truly for another, before skipper Taylor Walker marked, swung around and unloaded from 55m to give the Crows an 18-point lead at the long break. Rory Atkins was outstanding in the second quarter with 13 touches after just five in the first. 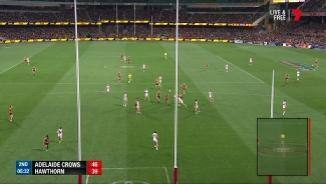 The Crows had a huge advantage in Inside 50s (33-18) and were in front in contested possessions (a +14 differential), but the Hawks refused to go away. Hawthorn: The Hawks reported a clean bill of health in another positive out of a tremendous night. 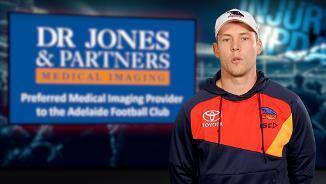 Adelaide: The biggest concern for the Crows is defender Luke Brown, who jarred his ankle and didn't finish the game. Winger Wayne Milera copped a knock to his knee, but the Club doesn't believe it is serious. The resurgent Hawks have a 10-day break before they take on Collingwood at the MCG next Sunday. 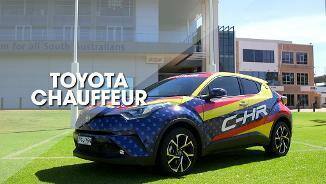 Meanwhile, the Crows have plenty of soul searching to do ahead of their clash with Carlton at the MCG next Saturday afternoon.